The lithium-ion battery maker blames the layoffs on slashed orders from customer Fisker Automotive. When will business pick up enough to bring them back? Thanksgiving didn’t have much to offer by way of thanks for about 125 employees of A123 who were laid off from the lithium-ion battery maker’s Livonia and Romulus, Michigan factories last week. The layoff announcements came just weeks after A123 reported rising third-quarter losses and lowered its annual revenue forecast, a sad state of affairs it blamed on reduced orders from big customer Fisker Automotive. 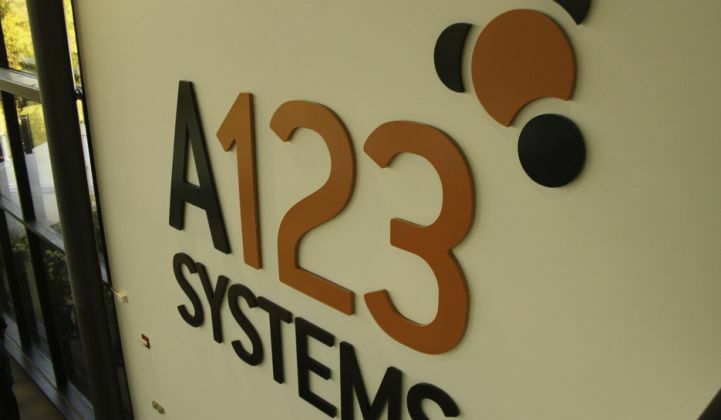 A123 has said it hopes to hire back the workers after six months or less, and still employs about 700 workers at the two plants and at A123’s engineering center in Ann Arbor, Michigan. “The part we really want to stress is we expect it to be temporary: hopefully, a blip we all get past,” A123 spokesman Dan Borgasano told local reporters. Still, for a company that built its Michigan plants with the help of a $125 million state grant and a $249 million Department of Energy stimulus grant, it’s a bad way to enter the holiday season. Given the troubles that bankruptcies at DOE loan guarantee winners Solyndra and Beacon Power have foisted on the Obama administration, A123’s layoffs aren’t going to be welcome political news in the White House, either. A123 has laid blame for the layoffs squarely on Fisker’s decision to reduce its orders for battery packs. The two companies inked a partnership last year which came along with a $23 million investment by A123 into Fisker. But Fisker has struggled to deliver its first car, the high-end hybrid Karma sports car, with only about 40 cars delivered to date. Earth2Tech reported that A123 said Fisker is now looking to delay full-scale Karma production until mid-2012 -- despite the fact that it’s raised close to $700 million, most recently with a $58 million tranche of a $150 million “pre-IPO” round. A123, for its part, has been posting losses since it went public in September 2009. What's more, the company’s third-quarter earnings call didn’t inspire confidence. The company reported a loss of $63.7 million, or 51 cents per share, compared with a loss of $43.7 million, or 42 cents per share, for the same quarter last year. That came despite revenues of $64.3 million, more than double the $26.2 million reported in the same quarter last year. A123 has also reduced its 2011 annual revenue forecast to a range of $165 million to $180 million, down from its previous forecast of $210 million to $225 million, largely due to the slowdown in orders from Fisker, the company said. With key consumer electronics battery customer Black & Decker shrinking its orders, and grid energy storage systems a growing but small part of its business, A123 really wants the automotive battery segment to pick up. Whether A123 can compete against Asian battery giants in the long game of supplying batteries for electric cars remains quite unclear, particularly if it keeps manufacturing onshore. Fellow U.S. lithium-ion battery maker Boston Power, which raised $125 million in September, has focused on manufacturing in China to compete. Noted greentech investor Vinod Khosla has predicted that A123 would “not be around” in 10 years. A123 shares were trading at around $2.30 as of mid-afternoon Tuesday -- quite a fall from the $20-and-up it enjoyed in its post-IPO heyday. It hasn’t traded above $10 per share since early 2011.